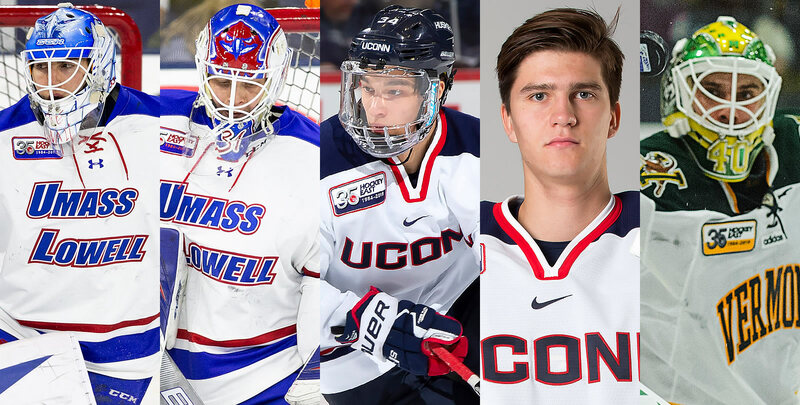 Lowell posted back-to-back shutouts for the first time since the 2014 Hockey East Championship weekend as the River Hawks downed Boston College and #2 Massachusetts in a set of games at the Tsongas Center. Tyler Wall (Leamington, Ont.) and Christoffer Hernberg (Espoo, Finland) pitched perfect games for UML, pushing their unbeaten streak to 10 games, the second-longest streak in the NCAA (8-0-2). UConn swept a weekend in Hockey East play, toppling #13 Northeastern, 3-2 in overtime, on Thursday night before shutting out Merrimack, 5-0, on Saturday. Tomas Vomacka (Truntov, Czech Republic) earning his first Hockey East win and his first shutout of his rookie campaign. Vermont and New Hampshire split a weekend in Burlington, Vermont. Vermont netminder Stefanos Lekkas (Elburn, Ill.) stopped 57 of 59 shots he faced, including 26 in a 1-0 setback. He made 31 saves in Saturday's 4-1 win. New Hampshire's two-point weekend put the Wildcats just one win out of third place in the current Army ROTC Hockey East Standings. #11 Providence and Maine split a weekend at Alfond Arena, with the Friars taking a 1-0 victory on Friday before Maine bounced back for a 3-1 triumph. Chase Pearson (Cornwall, Ont.) scored his 15th of the season and senior Brendan Robbins (Nashua, N.H.) netted the game-winning goal in the Black Bears' win. The 67th Beanpot culminates tonight at TD Garden as #14 Northeastern and Boston College battle for Boston bragging rights. The game will be shown live on NESN. Boston College advanced to the title game thanks to goals from two freshmen, Patrick Giles (Chevy Chase, Md.) and Jack McBain (Toronto, Ont.). Northeastern moved on thanks to more overtime heroics from Tyler Madden (Deerfield Beach, Fla.). Tyler Wall (Leamington, Ont.) 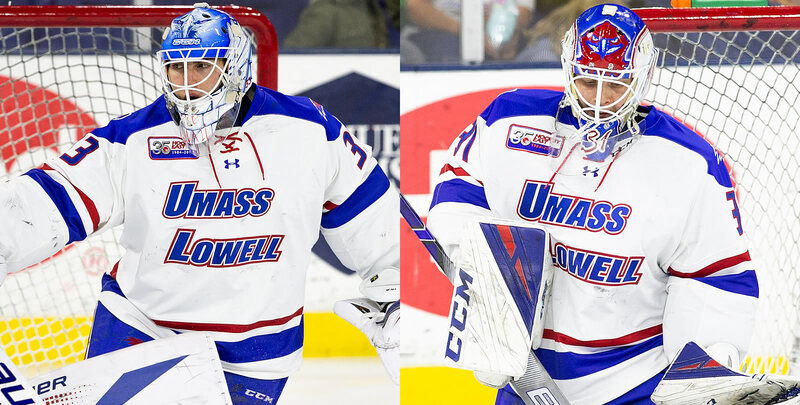 and Christoffer Hernberg (Espoo, Finland) each picked up a shutout over the weekend, lifting UMass Lowell to wins over Boston College and #2 UMass. Wall stopped all 28 shots from Boston College in his fourth blank sheet of the year and seventh career shutout, while Hernberg blanked UMass with 31 saves for his eighth career perfect game. Ruslan Iskhakov (Moscow, Russia) is currently riding a three-game point streak (3g, 4a) after helping the Huskies to wins over #13 Northeastern and Merrimack. In Thursday's victory over the Huskies, he set up the tying goal with 1:09 left in the third period to force overtime. He went on to score the game-winning goal in Saturday's win over Merrimack just 1:55 into the contest. On the weekend, he had one goal and three assists. 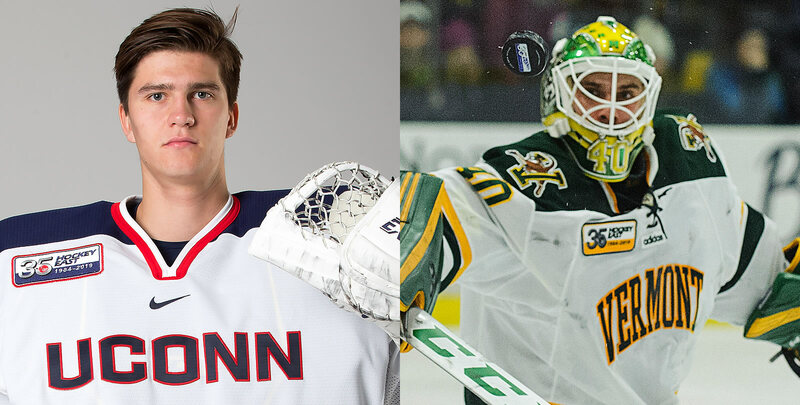 Tomas Vomacka (Truntov, Czech Republic) started each game for the Huskies last week, earning his first Hockey East win and his first shutout in a two-win weekend. He tied his season-high with 31 saves to help UConn to a 3-2 overtime win over #13 Northeastern on Thursday before kicking out all 29 in a 5-0 win over Merrimack on Saturday. Stefanos Lekkas (Elburn, Ill.) stopped 57 of 59 shots he faced from New Hampshire in a weekend split at home. Lekkas kicked out 26 shots in a 1-0 setback and made 31 saves in Saturday's 4-1 win to finish with a 1.01 GAA and .966 save percentage. Jack McBain, BC (Toronto, Ont.) Netted his sixth goal of the year on Monday, the game-winning strike that lifted Boston College over Harvard in the Beanpot semifinals. Patrick Giles, BC (Chevy Chase, Md.) Opened the scoring in the Beanpot semifinals, giving BC a 1-0 lead over Harvard in an eventual 2-1 victory over the Crimson. Shane Bowers, BU (So., F; Halifax, N.S.) Scored a shorthanded goal at #2 UMass on Friday and added an assist against #13 Northeastern on Monday in the Beanpot semifinals. He finished a plus-two on the week. Joel Farabee, BU (Fr., F; Cicero, N.Y.) Found the back of the net last Monday in the Beanpot semifinals and chipped in with a helper on Friday at #2 UMass. Jake Oettinger, BU (Jr., G; Lakeville, Minn.) Posted a .932 save percentage on the week and stopped 47 consecutive shots against #13 Northeastern in the opening round of the Beanpot. Jonny Evans, UConn (Fr., F; North Delta, B.C.) Enjoyed a career afternoon on Saturday, leading UConn to a 5-0 win over Merrimack with four points (2g, 2a). In his last three outings after missing 12 games due to injury, he has six points (2g, 4a). Chase Blackmun, UML (Fr., D; Hudson, Wis.) Had a team-high three points, all on assists, during a four-point weekend in Hockey East play for the River Hawks. He assisted on both game-winning strikes and claimed a plus-two rating.